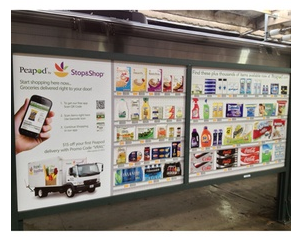 Peapod.com, world's leading online grocery and delivery company, executed bold strategies in 2012, resulting in a record-setting $500 million in revenues. Even better, Peapod has reported growing mobile orders by 50%, to achieve 30% of total revenue, or $150 million in mobile revenue. We've (WinSight, a leading Web Analytics and eCommerce Strategy consulting firm) been proud to partner with Peapod to develop and implement key strategies to help the company achieve exceptional breakthrough performance. Based on 2011 results, Peapod was ranked 52nd on Internet Retailer's Top 500 eCommerce Companies, with reported revenue of $479 million and 6% growth. In 2012, the growth rate intensified, driven by ground-breaking mobile commerce and virtual store strategies. In 2012, Peapod's mobile commerce strategies led to acquisition, conversion and revenue that rank among the top 10 mobile commerce companies in the world. Key to that growth was the implementation of 100 Virtual Mobile stores, perhaps the greatest grocery innovation since the bar scanner at checkout. And 2013 is off to an even better start, as the company continues to expand into new avenues of growth, such as Peapod Pickup, where shoppers can order by 10am and pick up their order anytime after 4pm. Business is booming, and we're glad to be a part of the explosive growth. For more about WinSight's Web Analytics and eCommerce Strategy consulting practice, contact raymondbritt@WinSight.net.